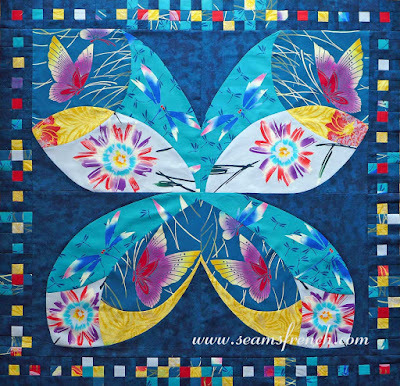 When I came back from the "Curves and Composition with Yukatas" workshop a few weeks ago, the four quadrants of my quilt top had been sewn together but not finished with a border. 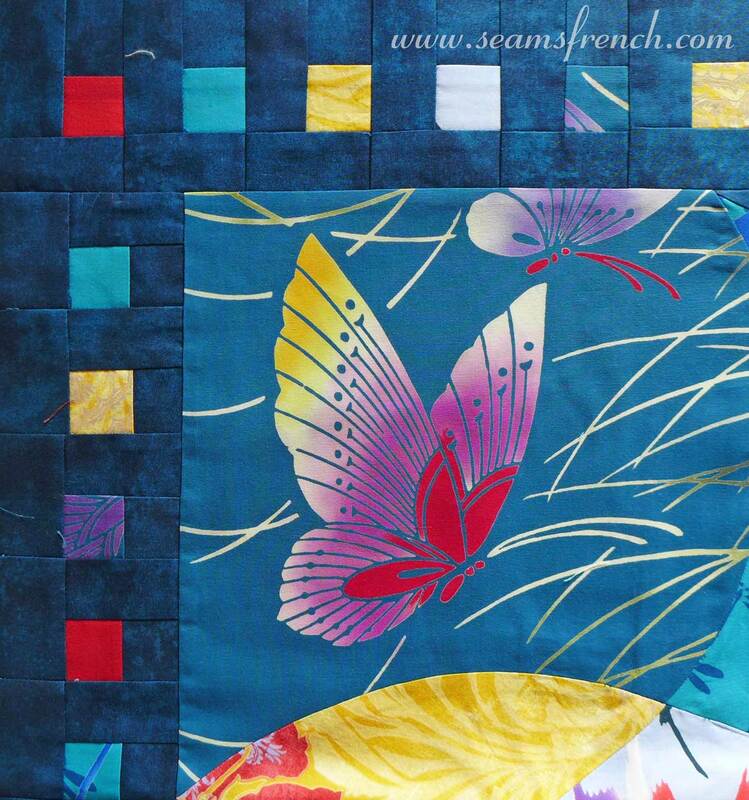 Borrowing an idea I had seen in one of Patricia's quilts, I decided a square in a square 3" block would use up some of the scraps, plus add a bit of a "glitzy necklace" frame around the butterfly. The idea was to encircle the 1" jewel coloured squares inside a navy border. When I ran out of the navy fabric, instead of cutting into another chunk of the navy yardage (which has been purchased to be the back of my silk wholecloth quilt), I decided to make a few of the blocks using just the jewel tones. These were casually interspersed around the border. I tried to add the more colourful blocks in areas of the quilt where the navy came to the edge. After the border was completed, there wasn't much of the "Yukata" fabric left over, but I managed to get a centre block made with what was left. Although none of the red yukata that I used as sashing on the back is on the front, I had cut into it for the butterfly, but decided against using it there. And, as you can see, I caved in and did cut into more of the navy yardage to finish the back. Hopefully my quilt shop still has some of that navy on hand so that I can replace what I used for this project. The quilt is now ready to be sandwiched and machine quilted. The border looks great too! Thanks. I think it finishes it up somehow.I'm looking forward to machine quilting when I have the time. Wow...I LOVE what you have done with the Yukata quilt! The curves are wonderful. And I DO LOVE a pieced back on any quilt. The red is perfect! Looks like you had a fun class. It was a great class. Patricia's method of curves creates amazingly flat curves. There were two "intermediate" people (they had done this workshop previously)in the class who made a tighter ribbon curve, with the same perfectly flat surface. You brought your Curves class project to another level with the addition of the border. It positively glows and has inspired me to rethink my project. Congratulations on a job well done. Thanks. Hope we get to see yours as well. Thanks. I appreciate the visit. 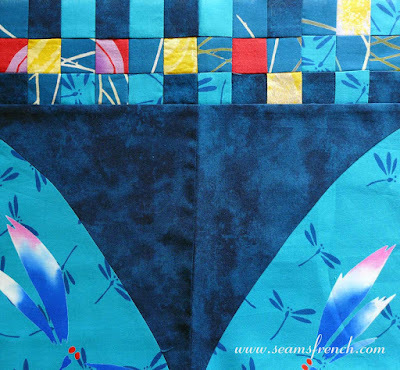 I think that the quilting will be fairly straightforward around the "built-in" designs in the Yukatas and then maybe something sashiko-like in the navy. 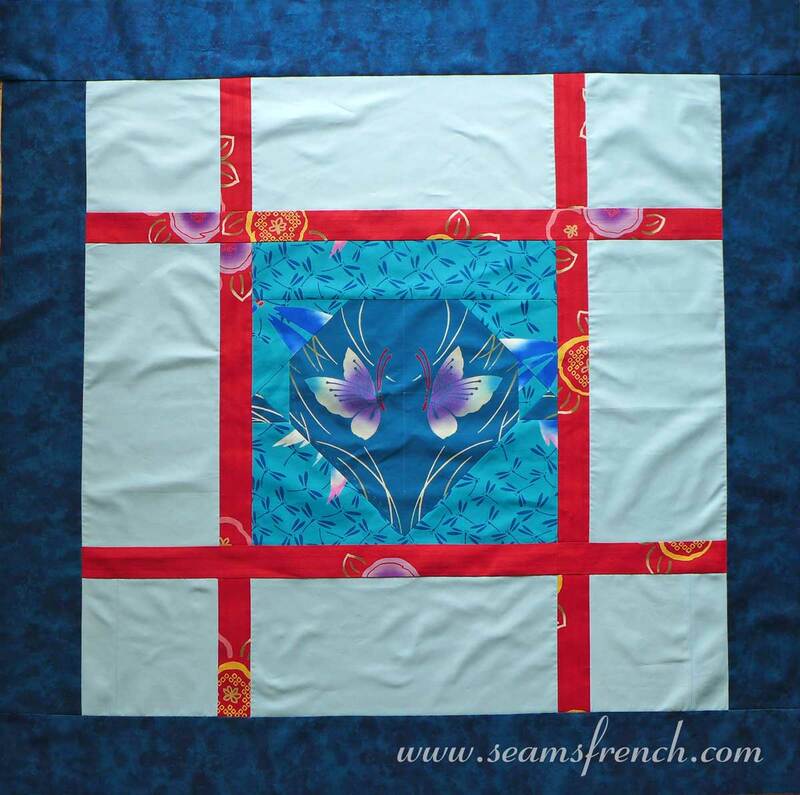 The FMQ always seems to take on a life of it's own once I get started, but I have great fun doing it.